The Seven of Wands has a similar in meaning to the Five of Wands; both cards indicate struggles after the initial fulfillment and satisfaction of an event. The Seven of Wands however is different as it is is about the struggle that you need to go through to maintain your position, rather than to attain it. This is about the difficulties we face to continue to have success. You should be ready for the competition to you defend your title, and to prove yourself. Others are going to desire the same results that you do, so you need to stay ahead of the them. There will be challenges to the success of your project or venture from an outside source. You must remain dedicated to your desires, and with a clear purpose and effort, you will overcome them. The overall meaning of the Seven of Wands is to hold your ground, no matter what is challenging your position. 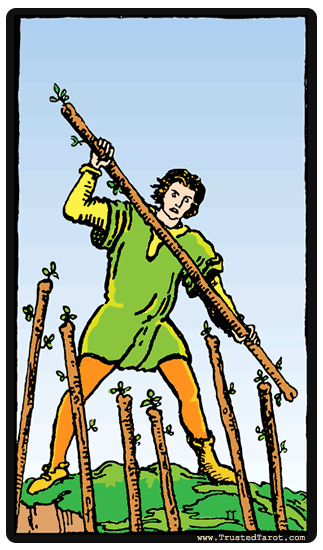 The overall meaning of the Seven of Wands is to hold your ground, no matter what is challenging your position. You will need to defend this position and take a stand against those who are aiming to take your spot. There are setbacks during this time, but you need to keep fighting for your beliefs and confront those that may threaten or oppose you and your beliefs. The Seven of Wands reversal meaning is that you could be feeling overwhelmed by all the responsibilities and challenges that you are facing. This can make it difficult to see the whole picture. You can also feel that you have to compete and compare yourself to other people, which leaves you feeling vulnerable and inadequate. The Seven of Wands reversal meaning can also reflect your feelings of being criticized and judged constantly by others. Your friends and family could be questioning you about your decisions and choices, and you feel overwhelmed by their judgement. Avoiding conflict and backing down is common with the reversed Seven of Wands. This can lead to unhappiness because you run away from activities and relinquish your goals, when you are challenged by anyone. Remember all that you fought for to be here, and think carefully on whether you truly believe that is worth giving up now. Another reading of the Seven of Wands reversed can also be that you are being too aggressive when you are protecting yourself and damaging your relationships by doing so.